Justine Mwanaisha Saidi, 2011 IBJ JusticeMakers Fellow Justine Mwanaisha Saidi has dedicated her entire professional life to reforming the Democratic Republic of Congo (DRC)’s judicial system. After receiving her Masters in Private Law and Judiciary, Justine became involved in a number of organizations committed to helping women secure freedom and equality. She has also served as a legal adviser to youth, educating young people about their rights and the legal system in general through her work at the Association of Friends of Father Tony (ASAFT). Justine’s fundamental goal is to assure respect for the presumption of innocence as outlined in the Universal Declaration of Human Rights and the Congolese Constitution. The Project: The DRC has a long history of human rights violations that continues to this day. Although the DRC ratified the International Pact on Civil and Political Rights in 1976, in which Article 14 stipulated respect for the fundamental rights of anyone charged with a criminal offense, these considerations are consistently ignored in practice. Magistrates, judges, police officers, prosecutors, and prison officials are often poorly trained, unmotivated, and corrupt, which results in a justice system that too frequently relies on torture and other breaches of human dignity. Young people are among the most vulnerable groups for a number of reasons. Many cannot afford a lawyer, which undermines their assurance of a fair trial. Furthermore, many young people in the DRC are unaware of their legal rights and the appropriate criminal justice procedures. In the city of Bukavu, for example, approximately 76% of accused people are juveniles and 70% of them do not have access to competent legal representation. Focusing on juvenile defendants, Justine used her $5,000 JusticeMakers Grant to provide free legal representation to detainees in the city of Bukavu. 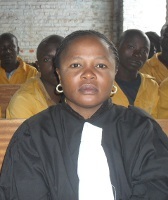 She sought to make prisoners aware of their rights and promote increased justice awareness and collaboration among Bukavu’s judges, police, prosecutors, and prison officials. One of the juveniles whom Justine represented was a 16-year-old boy who was arrested on the 20th of September 2008 for deserting and violating military orders. Ineligible for the Disarmament, Demobilisation, and Reintegration program, his file was transferred to the tribunal of peace. Justine challenged the tribunal’s lack of material evidence in prosecuting this child for this alleged military infraction. Ultimately, the tribunal did not examine the boy’s file, and an NGO took responsibility for his social reintegration. Justine also represented a married father of two who had been held in custody for two years on the grounds that he had allegedly insulted a soldier’s wife. The case had not been heard in court or examined by a judge. Justine presented the defendant’s file to a judge in court, arguing that his case should have been placed under the jurisdiction of a normal tribunal, not a military tribunal, as the alleged charge did not constitute a military infraction. She argued that it was therefore illegal for the court to keep this man in custody. In the end, the judge acquitted his case and ceased all judicial procedures. In addition to working directly with indigent clients, Justine organized a training session for magistrates, judges, attorneys, and court officials to enhance their knowledge of the rights of detainees and their responsibilities as criminal justice agents. 16 magistrates attended from the General Court of Bukavu and Kavumu, as well as 3 tribunal judges of the Grand Court of Bukavu, 1 military judge of Bukavu’s Military Court, and 2 attorneys. Justine’s colleague led a discussion on the requirements for placing an accused person in preventive detention while Justine delivered a presentation on the rights of detainees and the work of lawyers in the courts. In a follow-up report on this session, Justine disclosed that all of the authorities involved were encouraging and appreciative of the services Justine and her team provided. The final component of Justine’s project was a lobbying program based on the dissemination of information on legal aid to juvenile and indigent prisoners. Justine and her team sent out 2 letters of plea to the General Procurator and the chief of the justice division of Bukavu and organized two lobbying events in cooperation with other association partners including Lawyers Without Borders and the American Bar Association. The success of Justine’s project has had an enduring influence on the criminal justice in the province of South-Kivu. Her provision of legal aid has directly increased 10 individuals’ access to justice, and her lobbying campaigns have the potential to impact an even broader range of people. In continuing and expanding this work, Justine could systemically improve the local judicial conditions in South-Kivu. Furthermore, the information that she collected over the course of her project on the conditions of the Bukavu prison system provide a sound basis for further concrete actions to raise the consciousness of local prison and judicial authorities, in order to guarantee that all detainees have access to a fair trial.